Your water heater is important to your daily life but if something goes wrong, you need to know how to troubleshoot them. Your hot water heater is one of the most important parts of your home, from keeping your morning showers warm and relaxing to heating up the water that washes off your dishes after family dinner. 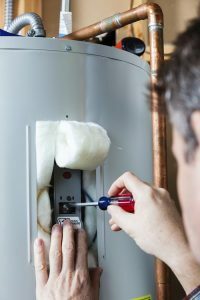 If your hot water heater seems to be on the rocks, here are some of the best ways to troubleshoot to determine what the problem is. Start by checking to make sure that the pilot light is lit. Sometimes, especially in the gusty winter months, it can get blown out by a window draft. If you are comfortable doing so, relight the pilot light on your own. If you smell any gas or the pilot is enclosed, call the gas company and Master Plumbing right away. Next, check the thermocouple to see if it is working properly. Sometimes, this piece stops the flow of gas completely and needs to be reopened once the pilot light is lit again. Readjust the thermocouple so that the tip is lined up with the flame from the pilot light. Finally, check the gas line to ensure that it is open and operating. If there are any problems, call your gas company to see about restoring service or having repairs performed. First, try the age old adage—turning it off and on again. Turn your electric hot water heater off for at least five minutes and then turn it back on. Once it’s been back on for about half an hour, check your water again to see if it’s warmed up. If that doesn’t do the trick, you need to reboot the entire system. Go to your circuit breaker and turn off the switch that leads to your electric hot water heater. Wait at least 30 seconds before turning it on again. If the switch doesn’t want to kick on stay on, the problem is probably with the circuit breaker and not the hot water heater. Finally, keep in mind that electric hot water heaters don’t last forever. If you’ve had yours for over 10 years, it might be time to explore a replacement. This entry was posted on Thursday, November 30th, 2017 at 3:39 pm. Both comments and pings are currently closed.